Beck made his name in the 1990s as a garbage man, an often-brilliant recycler of the detritus of popular music who turned cut-and-paste methodology into a nodding and winking high art form. Could this white boy seriously be attempting to craft stoner hip-hop out of the raw materials of rap? Could we take him seriously when he claimed to know where it’s at by virtue of his facility with two turntables and a microphone? Well, no. But it’s doubtful that we were meant to. All of this changed when Beck dropped the Fluxus approach to pop art and released the serious, searing, straightforward and singer-songwriter-based “Mutations” album in 1998. And then it changed even more drastically when “Sea Change” dropped in 2002, by which point it had officially become impossible to think of Beck as merely the jester in the court of pop culture. “Sea Change” revealed the man to be both an incisive songwriter capable of crafting his own songs from whole cloth, rather than a clever collage artist, and a serious record-maker who, along with “Sea Change” producer Nigel Godrich, had produced an artwork of contemporary resonance and enduring beauty. 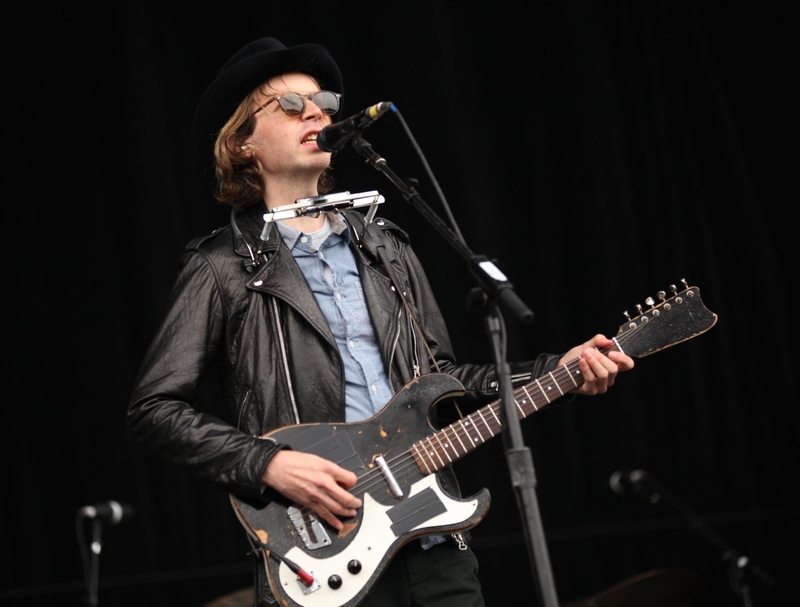 Beck has spent most of the past several years in a state slightly removed from the spotlight, releasing projects on a piecemeal basis through his website and crafting the “Song Reader” project, a collection of songs released in sheet music form. Interesting endeavors all, but with the arrival of “Morning Phase” this week, we can honestly say that Beck has produced a worthy follow-up to the watershed “Sea Change” album. Like its forebear, “Morning Phase” finds Beck employing minimalist constructions – tunes with sparse harmonic information, based on simple chord progressions played on acoustic guitar – as bedrock for the construction of right-brain pop mini-masterpieces. Beck’s father, arranger David Campbell, provides the string charts here, and they’re lush, elevating the harmonies in the songs without ever drowning them in the treacle of melodrama. The result is a soulful, mildly psychedelic sound that may well have been aimed directly at the many fans who continue to insist that “Sea Change” is Beck’s masterpiece. Sonically, “Morning Phase” might reasonably be referred to as “Sea Change 2,” but lyrically, the two albums are miles apart. The earlier record offered a forensically detailed account of the songwriter’s breakup, a split that appeared to have left Beck without much in the way of a will to live in its aftermath. “Sea Change” often is called Beck’s own version of Bob Dylan’s “Blood on the Tracks,” but really, it has more in common with the depressive beauty of a Nick Drake album. Despite its potentially cathartic nature for both the listener and the artist, “Sea Change” sounded like the work of a man who was seriously considering kicking the whole thing in the head. “Morning Phase,” by comparison, is the creation of a father of two who has made it safely to his mid-40s. The songs rekindle Beck’s early talent for fuzzy abstraction of the highest order, quite probably as a result of the personal contentment their creator has found. It’s nice to have this version of Beck back again. Rebeka has an uncommonly beautiful voice. The sound quality is just so pleasant. It’s not dark, thin or overly vibrato-laden. It is close to perfect. I think she should have taken “Dove Sono” from “Figaro” at a slower pace – it didn’t sound as sad and withdrawn as I think it should. Her arias from “Don Giovanni,” too, sound more like concert showpieces than the songs of women finding themselves at terrible crossroads. It’s hard to express emotion properly when the aria is lifted from the opera, but placing herself in the character under these circumstances did not seem to have crossed Rebeka’s mind. Sometimes it’s enough just to bask in the beauty, the perfect ornaments and vocal swoops. The challenging “Martern aller Arten” is fun, and the Queen of the Night’s arias, not requiring the human touch, are an unmitigated delight. The late Philip Seymour Hoffman wasn’t the only major 40-something artistic figure to grow up in the Rochester suburb of Fairport. So did the extraordinary Indo-American jazz pianist and composer Vijay Iyer. As a sideman, leader and composer, he has been one of the most spectacular figures in current jazz. His debut, therefore, on Manfred Eicher’s freedom-nurturing ECM records was one of the most promising of this jazz year. Alas, the news isn’t nearly as compelling as hoped in his 10-part composition for piano, electronics and string quartet, “Mutations,” which ECM terms “a journey over changing terrain” and those less kind might term a “ride over broken terrain.” According to Iyer, the 10 parts of the suite are “linked either genetically or by a kind of synthesis.” Iyer not only plays piano, he “plays” laptop, i.e., mixes prerecorded string quartet and electronic music. Unfortunately, the music on this much-awaited disc is closer to the thorniest and most difficult Ligeti than it is to Hendrix or even Roscoe Mitchell playing solo saxophone (another Iyer “listening pleasure”). When, in the late 1950s and early ’60s, “Third Stream Music” married jazz and classical music uneasily, it did so in two ways – the often academic and unassimilable way of Gunther Schuller and the graceful, even charming way of John Lewis and Jimmy Giuffre. This, alas, is redolent of the Schuller way. Some of Iyer’s music is some of the most extraordinary music in current jazz – particularly his work with that other Indo-Jazz master Rudresh Mahanthappa. This is music that seems more academic than experimental. Iyer is a member of the music faculty at Harvard. Good for Harvard. Perhaps less good for us.